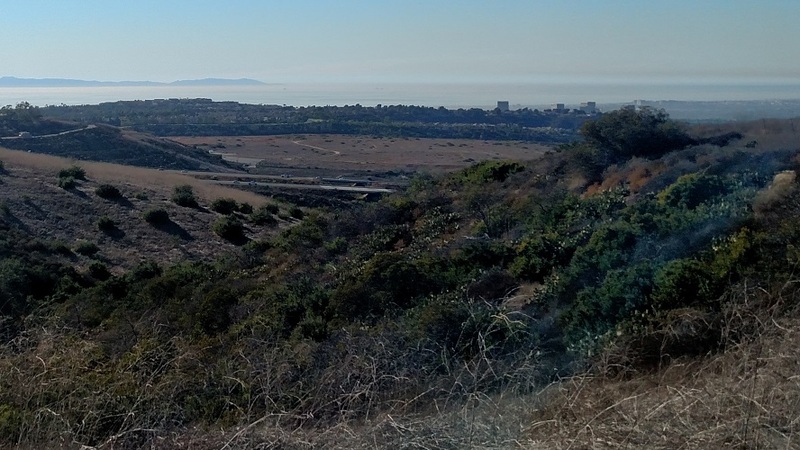 Irvine’s past and present are on display on this loop hike that uses city streets, bike paths and single track trails. You won’t find much solitude – you’ll be competing with noise from the 73 toll roads and the airport – but on clear days, the views are hard to beat. Almost all of Orange County is visible from the ridge and if visibility is good you will see the San Gabriel Mountains, Santa Monica Mountains and more. 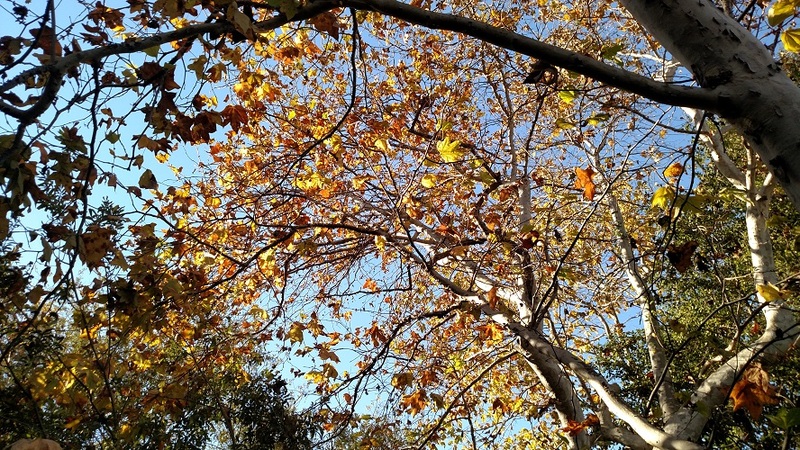 Other highlights include sandstone caves, historical artifacts and during the fall, bright foliage in the sycamores. Hiking the loop counter-clockwise, as described below, allows you to get the least interesting part of the trip out of the way first. Begin by following the bike path out of the parking area and to Shady Canyon Drive. The path follows Shady Canyon Drive for a short distance to Summit Park. Turn right and ascend to the gate house at the entrance to the residential community. Pick up the next section of the trail on the opposite side of the street, just before the gate. The trail climbs sharply, picking up about 250 feet in about a quarter mile to rejoin Summit Park. You now get a breather as the trail continues across the street, gradually descending past some more homes, soon taking in views to the southwest. Ignore the side trails until you reach a T-junction, shortly before the 73 toll road. Turn left and begin a steady climb, first paralleling the toll road and then bending away from it (east). More steady climbing brings you to the high point of the route, about 1,050 feet above sea level, with an outstanding view of Old Saddleback. From here the trail begins a steep descent, making some tight switchbacks as it drops down Bommer Canyon’s west wall. At the bottom of the canyon, you briefly enter the shade of oaks and sycamores, passing a junction with the West Fork Trail. 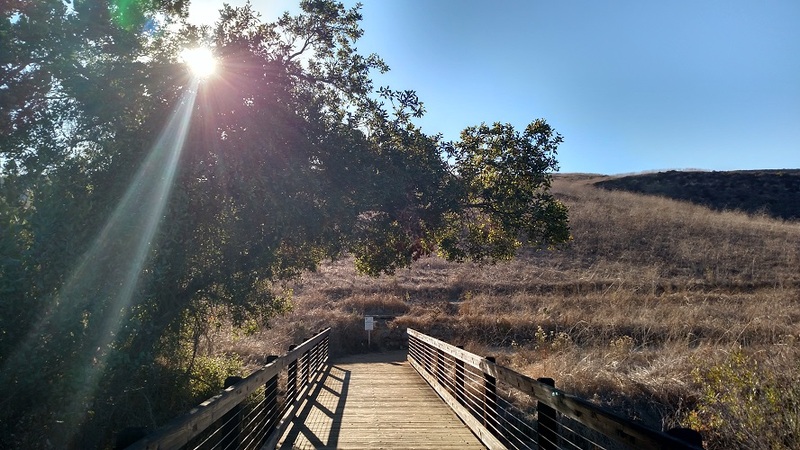 Turn right on the East Fork Trail (don’t worry if you have trouble remembering the junctions – in this area much of the land is closed to public use except for during programs run by Irvine Ranch Natural Landmarks, so there will usually be only one option at each junction). Almost immediately, you’ll turn left onto the Bommer Pass Trail which briefly climbs the hills on the north side of the canyon, providing a nice view of the corral area (for a more detailed description of the corral area and its history, click here). The Bommer Pass Trail deposits you on the opposite side of the corral. Now called the Nature Loop Trail, it crosses a footbridge and begins a pleasant meander through rolling hills. Follow the Nature Loop Trail and then the Bommer Meadow Trail for a mile back to the parking area. 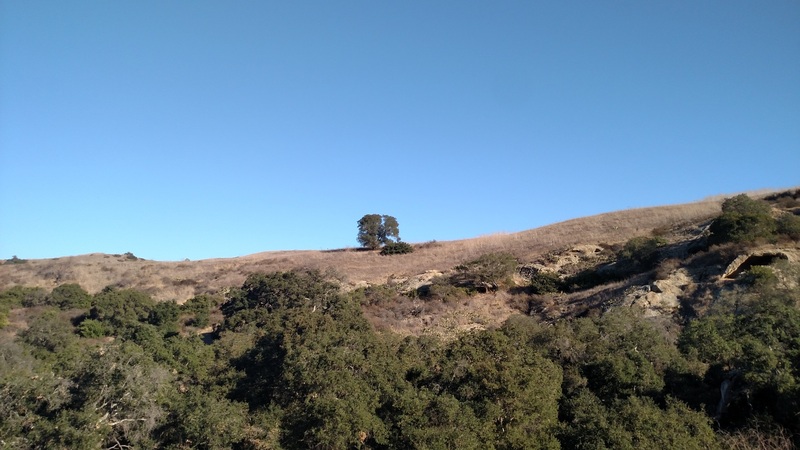 Both Coastal Ridge Park and Bommer Canyon Trail Head are accessible by car, so if you want to do a one-way version of this hike you can start at one end and have some one pick you up at the other. ALTERNATE PARKING — OPEN UNTIL 10 P.M. Although the parking lot at the Bommer Canyong Trail Head closes at 6 p.m., anyone expecting to return after 6 p.m. can park just across the street (and down a block) at Turtle Rock Community Park, where the parking lt is open until 10 p.m. To reach Turtle Rock Community Park, just continue down Shady Canyon another 1/4 mile, then turn left on Sunnyhill, and turn right into the parking lot. There is actually a trail that leads from the park over to the trailhead. Because there is so little elevation gain in the first mile of this trail, almost all the gain is packed into the last 1.-1.5 miles. The last mile of this trail up to coastal ridge is the steep part, and you’re looking at a fairly constant 10-15% grade. For those wanting a real workout (and sense of accomplishment) who have the ambition, energy and time, once you reach Coastal Ridge Park you can continue down a trail that takes you all the way to the Crystal Cove State Park ranger station and through the PCH underpass walkway to the beach. It’s 8 miles from the beach to the Bommer Canyon Trail Head. You could have someone come pick you up there in another car, or you can trek the 8 miles back to the Bommer Canyon Trail Head for a 16 mile round trip. Good and thorough information, thank you!